The English drum and bass group - which consists of Piers Agget, Amir Amor, Kesi Dryden and DJ Locksmith - have enjoyed incredible success since their single 'Feel the Love' topped the UK charts in 2012, but have admitted they could soon take their sound in a different direction. Speaking to BANG Showbiz, Amir shared: "We could easily do a reggae offshoot album or a hip hop offshoot album. "We've done so many weeks in the studio where we've come out with bunches of songs that don't really fit the whole body of work." 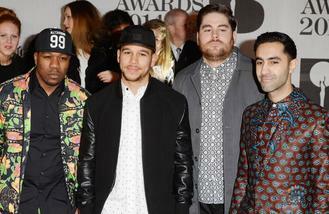 Kesi said that although the group could continue with their drum and bass material, they're keen to branch out. He explained: "We could easily release a reggae album. We spent a week in Jamaica in the studio out there, which was meant to be finishing off our album but we ended up just starting making reggae. "We was in there with the likes of Max Romeo, Chronixx and Barrington Levy, some real legends in there, as well as some current artists, so it was amazing. And I think it's just a testament to how eclectic we are. "We're so versatile, we don't just stick to making drum and bass or house tracks, we can hit the boundary." To catch up on all the highlights from Fusion Festival 2015, tune into 4Music (Freeview 18, Sky 360 and Virgin 330) on Saturday 5th September from 3pm to watch 'Fusion Festival 2015: The Best Bits'.